When my computer tells me the outside temperature starts with a (-)negative, as in below zero, I see no reason reason to venture outside. It's also time to make something hearty and spicy! It's green chili time! Living in Colorado afforded me the opportunity to experience fabulous Mexican dishes, as a large percentage of the population is Mexican. Some of my favorite finds were at wonderful road side stands with homemade tortillas and I need to also pay homage to the classic street burrito, sold out of a cooler at closing time in the LoDo bar district. That one usually came back to haunt you, but it was so good at the time! One of the best dishes I was first introduced to was green chili. Growing up in the Midwest, my knowledge of chili was that it had beans in it, and it was definitely red! If a chili turned green, back away slowly and do not eat it! Green chili, as it turns out, does not have any beans in it, is made from green chili's and can have varying degrees of green hue and heat. And yes, it's edible! Eat it as a big bowl of soup with a tortilla or smother a burrito in it; it is delicious! Below is my winter version of this fabulous dish in which I use canned peppers and tomatoes (it's hard to get fresh veggies when it's zero outside, go figure). When the season is right, I use fresh ingredients, roasting and peeling the tomatoes and chili's resulting in a deeper, richer flavor. Note that the following recipe makes quite a large batch, plan on freezing some and giving some to the neighbors who are also stuck in their houses and most likely don't have such a magnificent treat stewing. As always, please adjust according to your taste buds! If you're not a big fan of spicy foods, cut way back on the jalepenos, the chili will still have great flavor, just less heat. 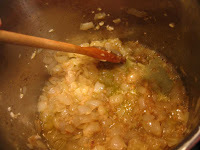 In a large soup kettle, Sautee the onions and garlic in olive oil until they are caramelized. They will turn a deep brown color on the edges. 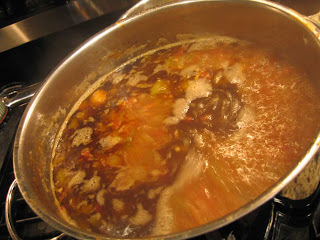 Stir often, scraping all the good morsels which stick to the bottom as this will give the base great flavor. Chop any remaining ingredients if you need to (being careful when chopping the jalepeno's, do not touch your eyes and wear plastic gloves if you have them) then add them to the pot. Add salt and pepper. Add water to the pot until it is full. Now let everything stew on medium high heat. Stir often, scraping any bits that are sticking to the bottom. When the chili has cooked down to nearly half, add water to fill to the top again and remain stewing. I like to do this process three times before I thicken it. If you want chunkier pieces in your green chili, only boil down once or twice. This is a v egetarian optional dish. You can add raw pork in the first portion with the onions, or you can add left over cooked pork with the chili's and tomatoes. It really is quite wonderful without it as well. 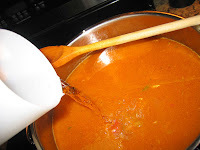 Once you have reduced your green chili down the final time (your soup pot should be a little more than half full), it is time to thicken it. Use a simple flour and water paste: 1 cup of flour, whisk in water until a thick, pour-able paste forms. Be sure whisk until all the lumps are out! I find warmer water helps. Now, slowly pour this into the green chili, still simmering, stirring the entire time. 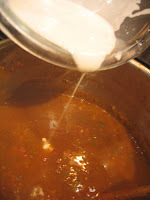 Let this continue to simmer until your chili is thickened and the paste has melded the flavors. Add a little more salt and pepper if needed. 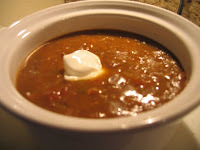 To serve as a soup or meal, top with a dollop of sour cream and serve with a warm tortilla. If your smothering a burrito, scoop the chili on top of your burrito... literally smother it! Pair either of these with a margarita or Mexican beer like a Tecate or Dos Eques, add a lime for zesty flavor. Enjoy!